Chocolate Crinkle Cookies are my favorite. If I had to choose only one cookie from a large variety, a Chocolate Crinkle would be my choice. Now if I have the opportunity to select two, of course, one would be a couple of Chocolate Crinkle Cookies, and the other would be Peanut Butter. Below you will find two versions. The first recipe is from scratch an adaptation of a recipe from America’s Test Kitchen “The Perfect Cookie Cookie.“; the other is the semi-homemade recipe using a Moist Devils Food Cake mix. Both are good, and each will have their own appeal. The homemade is more cookie-like, the cake mix version is as you would expect, more cake-like in texture. Now let’s get to making these awesome goodies. Adjust oven rack to middle position and heat oven to 375°F. Line several baking sheets with parchment paper and set aside. 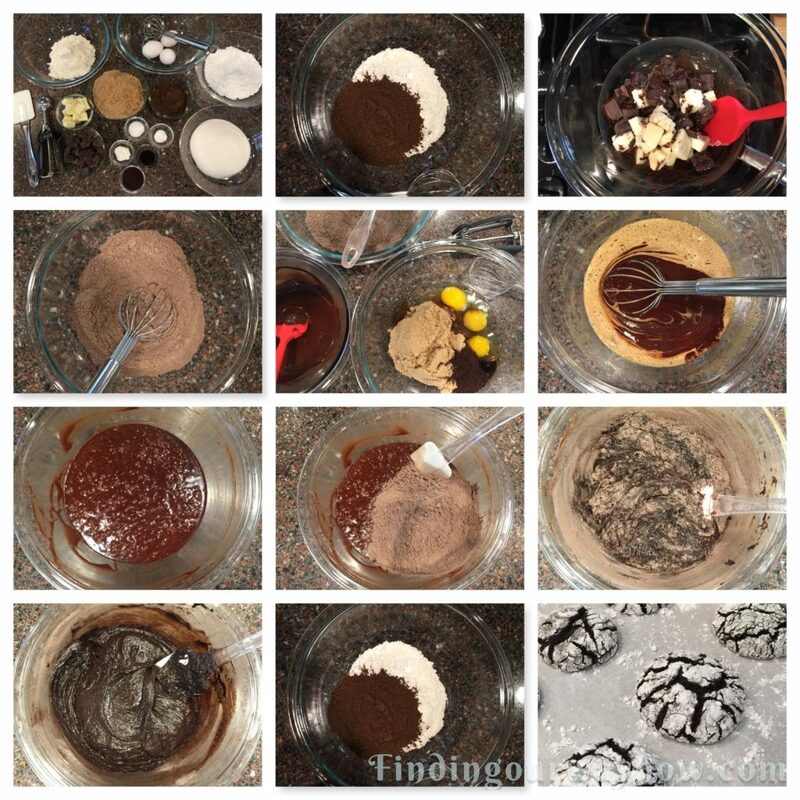 In a large bowl, whisk the flour, cocoa, baking powder, baking soda, and salt together until blended. In a different large bowl, whisk the brown sugar, eggs, espresso powder, and vanilla until combined. In a double boiler, combine the chopped chocolate and butter over medium heat until melted, 2 to 3 minutes. Slowly whisk the chocolate mixture into egg mixture until thoroughly combined. Fold in flour mixture until no dry streaks remain. Allow the dough rest for 10 minutes. Place granulated sugar and confectioners’ sugar in separate shallow dishes. Using a medium cookie scoop scoop out ball of dough and drop it directly into granulated sugar. roll the ball gently around the sugar to coat then transfer it to the confectioners’ sugar and roll to evenly and generously coat with the confectioner’s sugar. Place coated dough balls approximately 2” apart on the parchment-lined baking sheet, 12 per baking sheet. Bake cookies, 1 sheet at a time, until puffed and cracked and edges have begun to set, but centers are still soft (cookies will look raw between cracks and seem underdone), about 12 to 14 minutes, rotating sheet halfway through baking. Let cool completely on sheet before serving. 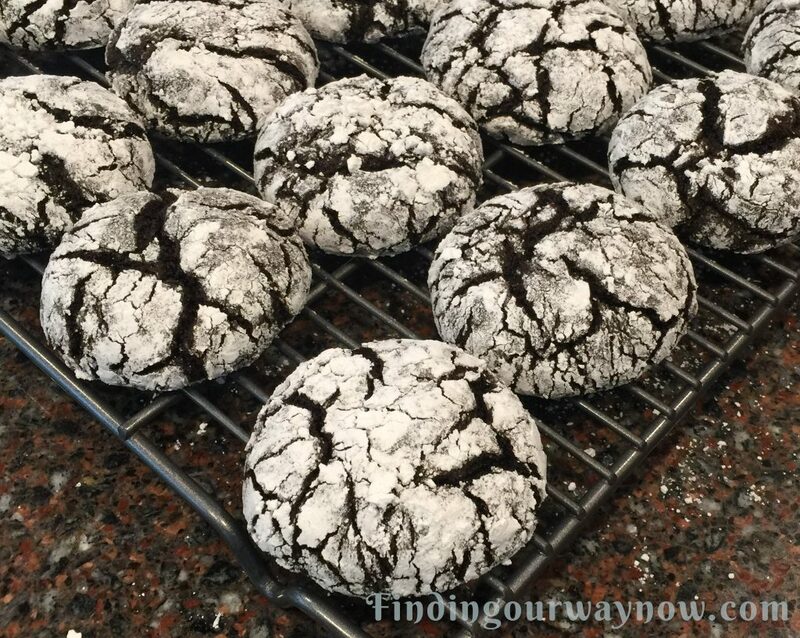 Store the Chocolate Crinkle Cookies at room temperature in a container for several days. You may freeze them for up to 3 months. Notes: The dough will be quite soft. Not to worry it will still work well. What is dark Cococa powder? It is just what it says, a much darker cocoa in coca and intensity. You may worry that the espresso powder will give them a coffee flavor; not to worry, it helps heighten the chocolate flavor with a barely noticeable effect. If you would like a Mocha Crinkle flavored cookie, increase the espresso powder by 1 to 1½ teaspoons or to taste. For a Peppermint Crinkle flavored cookie, substitute 2 teaspoons peppermint extract for the vanilla paste. Make sure to take care in forming uniform dough balls and coat them with granular sugar and then generously with confectioner’s sugar. Baking time will vary depending on your oven and the size of the cookies you decide to make. Add or subtract baking time accordingly for larger or smaller sized cookies. Using a wooden spoon, combine the cake mix, eggs, salt, vanilla, cocoa, baking powder, espresso powder, and butter until just blended. Chill the cookie dough in the refrigerator for about an hour or so. Line sheet pan with parchment paper. Preheat oven to 375° F.
Remove the chilled dough from the refrigerator. Place the sugar in a shallow bowl. Pour the confectioner’s sugar into another shallow bowl. Using a tablespoon measuring spoon scoop out a bit over the measure and form balls. Roll the balls in the granular sugar and then in the confectioners’ sugar until thoroughly coated. Place the coated dough balls on the lined baking sheets about 2 inches apart. Bake the cookies for 10 to 13 minutes, rotating the baking sheet halfway through the baking. (When done, the cookies will appear less moist in the cracks and are a bit firm on the sides.) Remove the cookies from the oven, leave on the baking sheet for 5 minutes and then move them to a rack to cool completely. Store the Chocolate Crinkle Cookies at room temperature in an airtight container for several days. You may freeze them for up to 3 months. Notes: Always use a super moist cake mix when making great crinkles cookies to ensure a good result. I prefer a Devil Food variety. You may worry that the espresso powder will give them a coffee flavor; not to worry, it helps heighten the chocolate flavor with a barely noticeable effect. If you would like a Mocha Crinkle flavored cookie, increase the espresso powder by 1 to 1½ teaspoons or to taste. For a Peppermint Crinkle flavored cookie, substitute 2 teaspoons peppermint extract for the vanilla. Make sure to take care in forming uniform dough balls and coat them with granular sugar and then generously with confectioner’s sugar. Baking time will vary depending on your oven and the size of the cookies you decide to make. Add or subtract baking time accordingly for larger or smaller sized cookies. One last thing, why roll the dough balls in granular sugar and then in confectioners sugar? It helps to ensure the confectioner’s sugar isn’t absorbed too much into the dough while cooking which allows the crinkles to show off a snowy white cracked appearance. It also gives the outside of the cookie a very lovely light crunch. Now, who wouldn’t love either one of these? 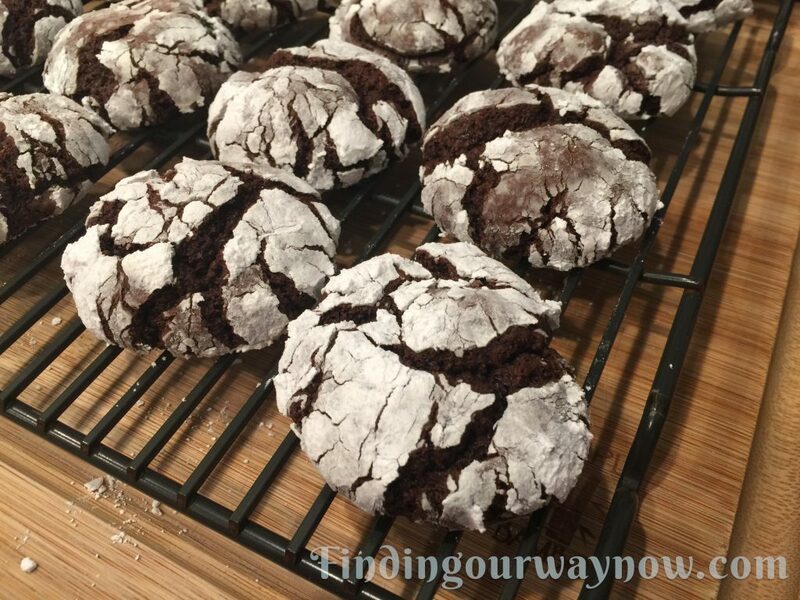 I know I sure have enjoyed making, sharing and eating these Chocolate Crinkle Cookies.